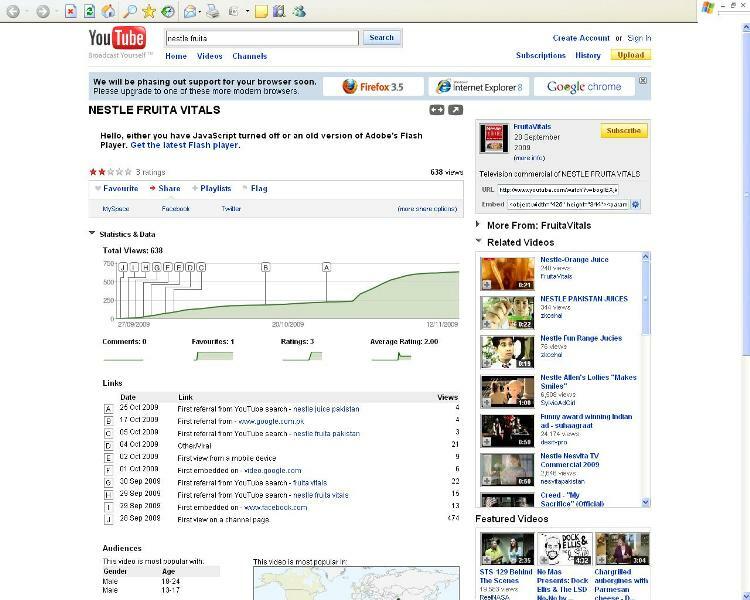 Nestle Fruita Vitals campaign is an interesting online campaign that has caught the attention of some members of the Pakistani online community. The keyword here is ‘some’ because although the campaign is geared towards getting viral, it hasn’t done so to the extent that you would expect it to. Why would you expect this viral campaign to go big? There are a number of reasons for that. One, it is being conducted by Nestle, the largest MNC (Revenue-wise, surpassing even Unilever) operating in Pakistan. Secondly it is being simultaneously conducted on the viral networks of today, viz. Facebook, Twitter, Youtube, augmented by a dedicated website 7days1night. Thirdly, and more importantly, there are an estimated 2 million online users in Pakistan, more than 500,000 of which are on Facebook. Nestle’s campaign falls way short of this number. How do we know that? The evidence is right there in the number of comments the website has received (about 6,200) as well as the number of Facebook members which stands at a mere 5,438 members. But even if you ignore these figures, how many people do you know who spend a majority of their time online knew about this event? Many of my net-savvy friends didn’t know about it. I deliberately search for such online events and even I almost missed it. The premise is simple enough. You need to state why you should be the one to be adjudged the winner. The interesting thing is you can give as many reasons as you want, but no two reasons should be posted within five minutes of each other. The even was divided into two parts, the winner of the first stage got an Ipod Touch and the second stage winner got to have an HP Notebook in addition to a limo ride and dinner with six friends. This pretty much ensures that each and every visitor spends a lot of time on the site and brand profile pages on facebook and twitter. Simple but cunning nonetheless. The other thing surprising about this event is that it hasn’t caused any major ripples in the blogosphere. Apart from Teeth Maestro and ProPakistani, no one has really bothered about it. Even both these bloggers have just posted the most basic of information. 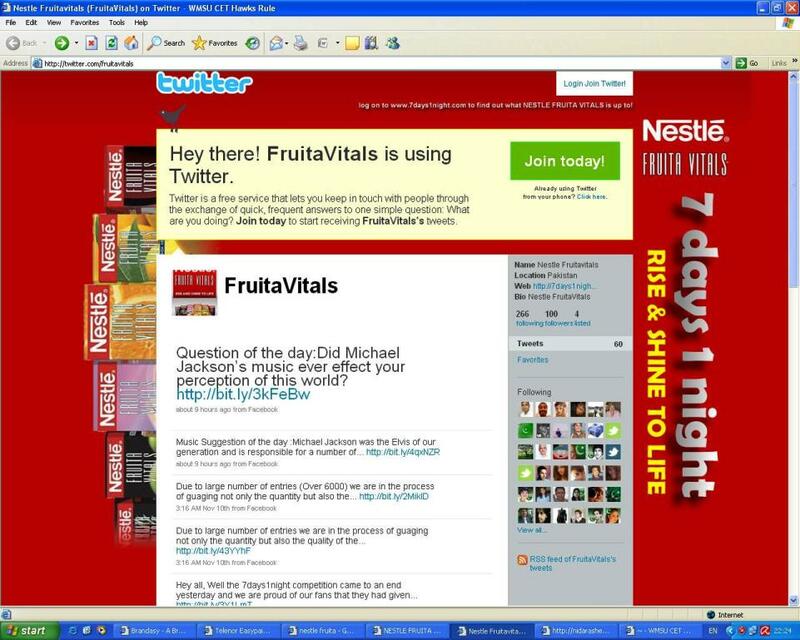 If you google the phrase nestle fruita vitals, most of the results reflect material posted on the net by Nestle itself. Not many independent reviews, unfortunately for Nestle. In fact, even most of the independent reviews are just reverberations of Teeth Maestro’s post. So, is it a failure? Not really. It all depends upon the goals set by the brand manager Beenish Pervaiz. If her goal was to target a particular niche of young people, and the interaction was more important than the penetration, then it may be construed as a success. It all depends upon the perception and objectives of the people running the show. It won’t figure prominently in the list of top viral campaigns, that’s for sure. The Lays Chips Haram controversy was more viral than this even though it was merely spread through email which then got picked up by the bloggers. But then it had more time to ‘germinate’ than this one. After all, a couple of weeks is too short a time to spread the word, even if it is online. 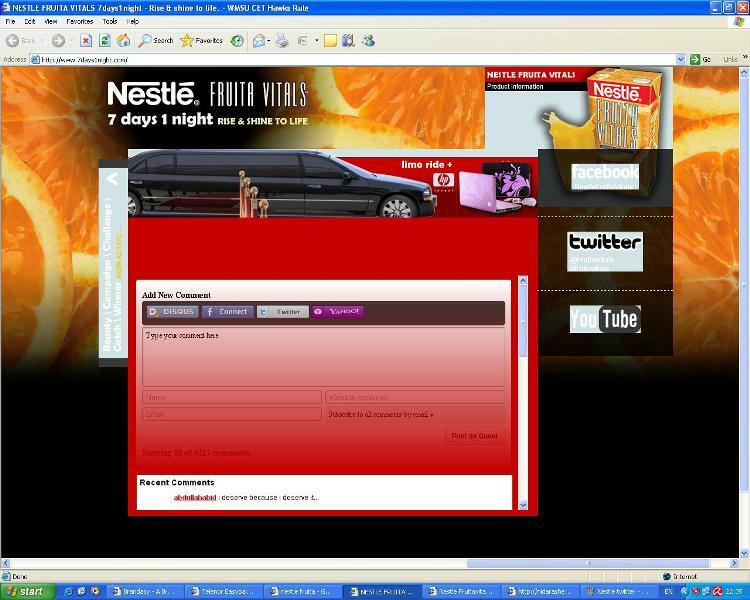 To Nestle’s credit, all the communication material online is immaculately thought out and designed including the Facebook profile. The one thing missing is the lack of Facebook applications. Remember Burger King and their double whopper application on facebook where you could get a free whopper for sacrificing your facebook contacts? This innocuous tactic spread like wildfire in the online community so much so that Facebook had to step in and shut it down. This was an ideal opportunity for Nestle to do something along those lines. And these viral events really get you thinking what are the essential ingredients of a successful viral campaign? Here is Nestle, a giant of an MNC which has come up with a pretty safe campaign strategy which encompasses all the electronic media, and yet it doesn’t achieve the magnitude of an epidemic outbreak which, let alone organizations, mere individuals have been able to attain. Remember the ‘Numa Numa’ video (fat kid dancing) on Youtube? That video has been viewed over 900 million times all over the world and has made a star out of that guy. His investment was a computer, internet connection and a webcam. He comes nowhere even close to the effort and time and money put in by Nestle. So what gives? 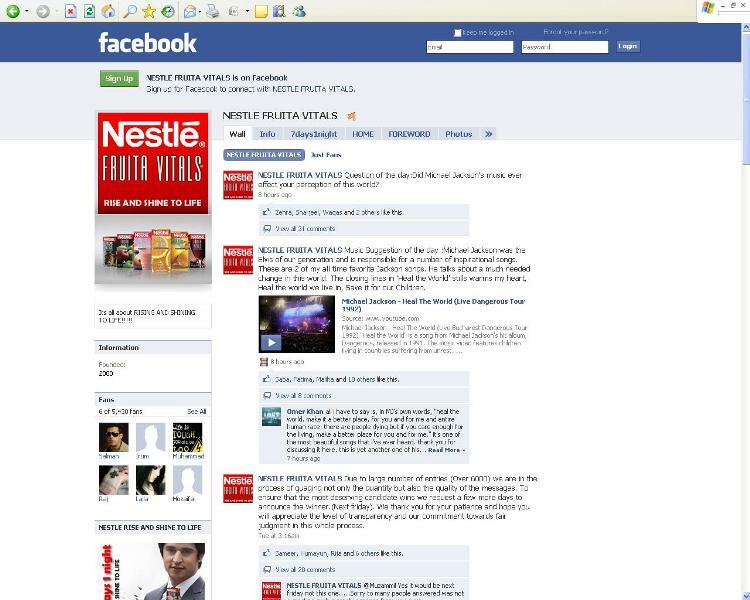 If Nestle’s aim was to nurture brand evangelists, then this campaign which concluded two days ago was right on target. The winner along with his six friends is definitely going to have a stupendous experience which he’ll associate with the brand, and hopefully stay loyal and vocal about the brand for life, unless of course, things don’t go wrong terribly. Pakistani marketers have had some good success with their online campaigns like the Samsung Treasure Hunt, but none so far have matched the viral speed of the controversial emails that spring up in the Pakistanis’ inboxes from time to time. It’s high time that some brand came along that swept the whole nation off its cyber feet. And it better be something positive. « Telenor Easypaisa- a futile exercise in branding?